Exciting times… By the end of this post we’ll have something that loosely resembles the beginnings of a game! 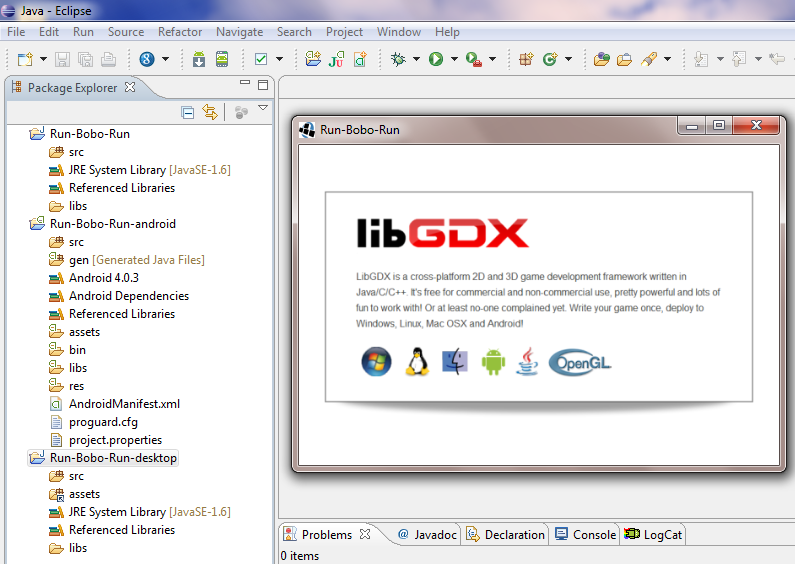 Not only that, we’ll be able to run it on the desktop or if we like on android (either a real phone or the emulator). It really will be just the beginning though… Today’s focus is on creating a game world comprised of block objects, adding a player controlled object (Bobo) to the world, and locking the camera onto Bobo such that the level ‘scrolls’ and Bobo always remains within sight. Later we’ll deal with collision detection, game winning states, scoring, etc, but for now let’s just take it one step at a time! I created a couple of sprites to get us started, bobo.png and block.png (both 16x32px per original spec). These should be placed in the assets/data dir of the android project. While you’re at it, delete libgdx.png, you won’t be needing it again. Open AndroidManifest.xml (it should be in the root of the android project). For now, all we need to do here is change the android:screenOrientation value from “landscape” to “portrait”. I renamed MainActivity.java (android project src) AndroidStarter.java, and Main.java (desktop project src) DesktopStarter.java. Just personal preference thing. Nothing needs changing in the android starter, but in the desktop starter we should set cfg.width to 240, and cfg.height should remain as 320, this just means the app we preview on the desktop will default to the target resolution of 240×320. With the initial setup out of the way, we can now get on with the business of making our game. We’re only implementing the GameScreen right now, but we’re aware that there will be more screens added later on, so we should probably plan for that from the outset. There’s a nice little article here on the subject, makes a lot of sense to me so let’s do it! The libgdx-users wiki article does a great job of explaining so I won’t bother going into it any further here. There’s not a whole lot to the Block class. A couple of constants define the size (measured in pixels), a Vector2 is used to record its position in the world (set during construction), and there’s a position getter/accessor method. That’s all there is too it. // A simple class for Bobo, all straightforward apart from maybe update method. // We simply add the distance travelled in delta seconds to Bob’s current position. // as velocity and we multiply that object’s value with the elapsed time delta. So far so good. Time to implement the GameScreen! // nasty temp cludge to blat out a bunch of blocks... will be replaced by level generation algorithm soon! I think the code and comments (don’t miss the links in the comments!) should make sense without too much further explanation. The controls are more than a little bit dodgy (no diagonal movement, and you’re stuffed if your phone has no cursor keys), the ‘level’ is hardcoded, the assets aren’t disposed cleanly on close, and there’s no doubt a lot more that needs tidying up, but this post is getting a bit long so I’m going to leave it there for now. When all is said and done, we have an application that will run on the desktop and on android, and the camera follows Bobo around the world, that’s exactly what I hoped to achieve today, so this seems like a good place to stop. 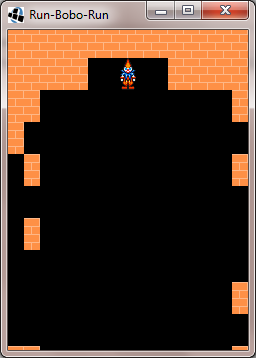 Next post I’ll probably look into pulling in the level generation algorithm, and maybe do some collision detection, or maybe investigate accelerometer controls, I don’t really know yet! The code I publish here is open source. The blog content itself © All Rights Reserved 2012-2016. Awesome Inc. theme. Powered by Blogger.